DINGLE, Ireland — "I never did see 'Secret Ceremony,' to tell you the truth," Robert Mitchum said. "Did Mia call Elizabeth her daddy?" They did some weird things with that script because contractually they had me for 10 days only. They were in trouble when I got there and I don't think I improved the situation any. "Apparently after my 10 days were finished they took two scenes that I was in and recast them with Elizabeth. You now that bathtub scene? In the script, I was in the bathtub with Mia." Mitchum's eyes narrowed. "The scene where she was rubbing Elizabeth's back. Licking her back. In the script that was my back." A slow grin. "I was scheduled for milk and cookies," Mitchum said. He spun the ice in his glass. "What's this? Scotch? No cookies? We were shooting in that hideous house the whole time. Joe Losey has an architectural fetish. Sometimes you think he'd be happy to clear the actors out altogether and just photograph the rooms. He never says a word. Not one word. He walks into a room and engineers and choreographs and the the actors go through it. Then he prints it, and that's that. "All the same, I guess 'Secret Ceremony' was good at the box office. Just after we made it, lesbianism came in. Maybe that's why they reshot the bathtub scene. I'm no damn good as a lesbian. Play anything else, but not that. Of course lesbianism has been around for a long time. But Losey's heart must be gladdened by the success of 'Secret Ceremony.' Maybe not, I doubt if anything really gladdens old Joes' heart. I think he has dyspepsia." Mitchum stretched his legs out long under the coffee table. Whirled the ice in his glass. Whistled: My heart goes where the wild goose goes. Across the room his man, Harold ("Harold? He's my man"), mixed fresh drinks. 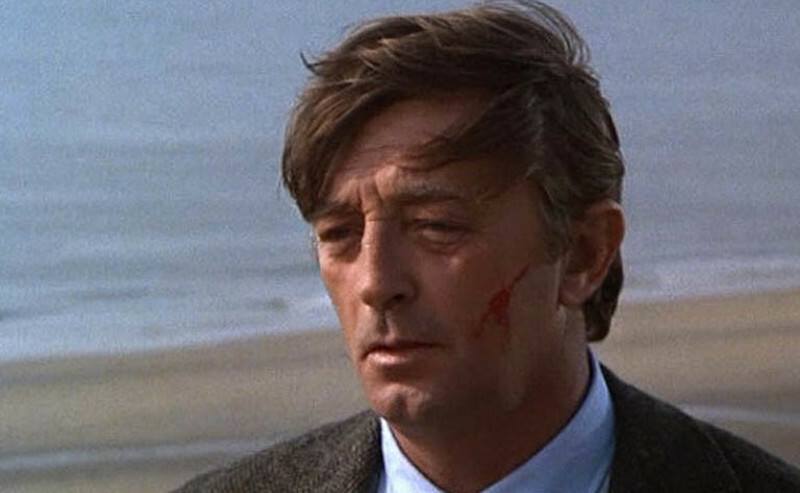 It is Mitchum's day off from shooting David Lean's new movie, "Ryan's Daughter." The afternoon runs down into evening as well in Dingle as anywhere, inspiring nostalgia, deep thoughts, philosophical questions. How long you figure you got to live? “About... oh, about three weeks. I have this rash that grows on my back every 28 days. I was bitten by a rowboat when I was 13, in a park in Cleveland, Ohio, and every 28 days a rash appears on my back. I've offered my body for science." My heart flies where the wild goose flies. "Meanwhile, I sit here in Dingle and vegetate. I was a young man of 26 when I arrived here last month. The days are punctuated by the sighs of Harold as he waits for the pubs to open. But don't get me wrong. Usually I'm gay with laughter, fairy-footed, dancing about and rejoicing. But this afternoon...well, I just woke up. So I sit here and weep. Finally everyone staggers into town to Tom Ashe's pub and leaves me here alone weeping. That's my day." Mitchum whirled the ice in his glass. "Thanks, Harold." Harold poured Chivas Regal into the glass. "Harold stands in for me." He doesn't look like you. "Doesn't have to. He's an object on which to focus. Been with me for years. Lost without him." Mitchum sits in Dingle in a cottage by the bridge over the river, waiting to do his scenes in "Ryan's Daughter." "At least 'Ryan's Daughter' is the latest thing they're calling it, he said." "First it was going to be 'Coming of Age,' then it was going to be 'Michael's Day,' or some goddamn thing. Then for a long time it didn't have a title at all. It was called the David Lean Project. It was during that period that Trevor Howard and John Mills nearly got killed when their boat overturned in the surf. That was on every front page in the world, and the movie didn't have a title. So they blew millions of dollars of publicity. Now it's 'Ryan's Daughter.' They're having a hell of a time matching shots. We had one perfect day on the beach, and then the rain closed in. Ireland makes the rain a national monument, so the tourist season lasts 12 months a year. After the first 10 days of shooting, we were already seven days behind. So here I sit, practicing my accent. 'With 'Secret Ceremony,' they sat around discussing who they could get with the right accent. Finally Elizabeth suggested me. They didn't want an actor whose accent was so English it would bring Elizabeth's into relief. So Losey called me in Mexico and asked if I could do an English accent. Hell, yes, I could. What do you want? North Country? Lancashire? Cockney? He asked for an indifferent accent, so that's what I gave him. Then I read a review asking what in hell Mitchum was trying to do if he thought that was an English accent. They should write the director's instructions on the edge of the screen. "But I don't give a damn, I must be good at my job; they wouldn't haul me around the world at these prices if I weren't. I remember one picture — 'Wonderful Country,' I think it was — where the character comes across the border from Mexico. Bob Parrish was the director and he wanted me to gradually lose my Mexican accent and then pick it up again when I went back to Mexico." Mitchum spead his hands, palms up, and shrugged. "Parrish is essentially a cutter, not a director. There are several of those. Bobby Wise, for example, couldn't find his way out of a field without a choreographer. Bobby even times a kiss with a stopwatch. He marks out the floor at seven o'clock in the morning, before anybody gets there. Lays it all out with a a tape measure. True. It's very difficult to work that way. I worked with him and Shirley MacLaine and Shirley said, 'Why doesn't he go home? He's just in the way...' "
Mitchum's attention drifted. Outside the window, children played in the road. They called to each other in Gaelic; on the Dingle Peninsula, Gaelic is still spoken. The Lean film is set there during the Easter Uprising of 1916. Mitchum plays a school teacher. He marries Sarah Miles, but she falls in love with Christopher Jones, a British officer. Harold put on an album. When I was seventeen, it was very good year. Mitchum nodded his head to the music. He rubbed his eyes and yawned. Then he laughed again. "Bobby Wise," he said. "I never saw 'The Sand Pebbles.' Of course that was a problem picture out in front, with Steve McQueen in it. You've got to realize a Steve McQueen performance just naturally lends itself to monotony." A melancholy shake of the head. "Steve doesn't bring too much to the party." A silence fell. Mitchum yawned, and let his head drop back. He stared up at the ceiling. "No way," he said. "There's just no way." Drawing out the no. "Noooo way." He took his glasses out of his shirt pocket and put them on. Then he swung around again and dropped his feet to the floor. "But who gives a damn? I've gotten grooved into making movies, so why not? It's too late for anything else. Before that, I used to be a writer. I wrote movies, radio continuity, I was a junior writer at a studio. I've only written one of my own pictures, though: 'Thunder Road.' Right into that big transformer. What a way to go. Well, I can think of 12 different ways to go. But I was a writer." Mitchum put his glasses back in his pocket. He emptied his glass. "I've put away more goddamn Scotch since I got to Dingle than I've put away in my whole goddamn life," he said. "No, there was Vietnam... One day we were out there in the boondocks and I must have had 14, no, 16 cans of beer and the greater part of a bottle of whisky. And that was at lunch. Then they took me back to base in a helicopter and all the clubs — the officer's club, the noncom's club, the enlisted-men's club — they all said, Come on, Bob have a drink. No way, I said. No way. I’m a Mormon bishop. Sure, Bob, we know. "That goddamn place. You know what the gooks do? They bomb the outhouses. They know how to get the Yankee dog where he lives. The Yanks are always building outhouses and the Cong is always shooting them down." Mitchum took a fresh glass from Harold. "No way," he sighed. "I've looked into it, and there's just noooo way." "Well, my father was killed when I was three, so I was principally shipped around to relatives. I finally left when I was 14. Jumped on a train, came back, left again when I was 15, wound up on a chain gang in Savannah, came back, went to California. My first break was working for Hopalong Cassidy, falling off horses. "So now I support my favorite charity: Myself. That's where the money goes. My wife, my kids. I have a brother, weighs about 280 pounds. Two sisters, a mother, a step-father. I think my sisters are religious mystics. They belong to that Baha'i faith." Mitchum stood up and walked over to the window. "Let's take a walk around the house," he said. It was nearly dark outside, cold and damp, the lights of Dingle on the hill across the river. "It's going to be a good picture," he said. "I trust Lean. He's a good director. He'd better be. This is eight goddamn months out of my life. I'll be here until the last dog dies." He kicked at the grass, his hands in his pockets, his face neutral. "Any more questions?" he said. Are all the rumors about you true? "Oh, sure, every one. Where there's smoke there's fire. Make up some more if you want to. They're all true. Booze, broads, all true." "I don't have any," he said. "I sit and weep and wait for the weather to change, waiting for my crop to grow." He leaned over and picked up a flower pot that was leaning against the side of his cottage. A sickly spindle of twig grew in it. "My crop," he said "I'm waiting for my crop to grow. In my hands I hold the hopes of the Dingle Botanical Society."